We all outfit for comfort when it comes to dressing up, and this combination of a white knit oversized sweater and Philipp Plein wax effect leggings from farfetch.com is a practical example of that. And if you want to instantly kick up the style of your look with one piece, add black leather ankle boots to the mix. If you're searching for a casual yet stylish getup, try teaming a white tunic with Philipp Plein wax effect leggings. Both garments are totally comfy and will look fabulous together. Throw in a pair of tan leopard suede ankle boots to take things up a notch. 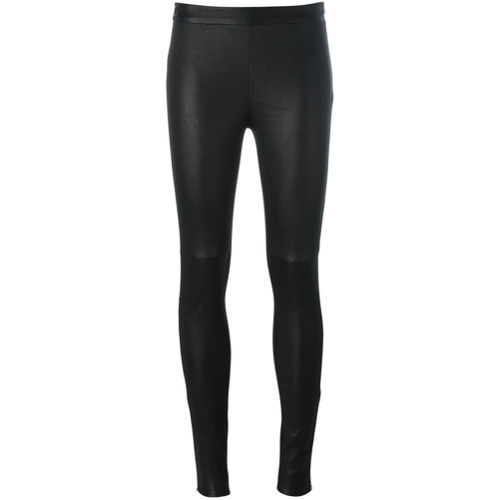 If you're on a mission for a casual yet chic look, reach for a black coat and black leather leggings. Both garments are totally comfy and will look fabulous paired together. When it comes to shoes, this look is finished off nicely with black low top sneakers. Choose an olive military jacket and Philipp Plein wax effect leggings from farfetch.com for a trendy and easy going look. Elevate this look with white low top sneakers. We all seek comfort when it comes to dressing up, and this combination of a purple oversized sweater and Philipp Plein wax effect leggings is a practical example of that. When it comes to shoes, this outfit is round off wonderfully with white leather high top sneakers. If you're in search of a casual yet chic outfit, reach for a beige fur jacket and black leather leggings. Both items are totally comfy and will look fabulous paired together. Add silver leather loafers to your ensemble for an instant style upgrade. If you're obsessed with relaxed dressing when it comes to your personal style, you'll love this cute pairing of a grey cowl-neck sweater and Philipp Plein wax effect leggings. Wearing a pair of black suede pumps is a simple way to add some flair to your getup. If you're all about relaxed dressing when it comes to fashion, you'll love this stylish combo of a grey sweatshirt and Philipp Plein wax effect leggings. Amp up the cool of your look by finishing off with black suede ankle boots. If you're a fan of relaxed dressing when it comes to your personal style, you'll love this cute combo of a grey shearling jacket and Philipp Plein wax effect leggings from farfetch.com. Dress up this getup with black leather ankle boots.